When you start looking for a tenant, be sure to ask for references. Many times landlords collect references and then just let them sit in a drawer. If you take a reference, which a landlord should, also make sure you check it out. It is a simple call away to an employer or any other referee and it will help you make a sound decision. You will have to seek consent from the prospective tenant and their permission to view their bank statement or employers information. This is a sensitive issue and many tenants would not agree to it but you have to tread carefully and do it for the sake of your tenancy. This should be done to ensure that the tenant has the ability to pay. Often times many tenants who do not comply with this request, are usually the ones who are not capable of making the payment. Use a standard application form to fill out contact and other relevant details regarding a tenant. You may also obtain such a form online and it will help you to keep tenant details organized. Instead of collecting different information and parchments of information for tenants, utilize a standard form to file and evaluate a tenant’s details. Do not opt to settle for the first few tenant application you receive. Instead, take time to review all the applications and set a criteria for yourself as to what kind of tenant you would want. Only select a tenant when they fill that criterion 80-100%. Otherwise you would not be choosing the right tenant and this can cause problems for you later on. Let the tenant know that the selection may take time. Before you choose a tenant, be satisfied with your own decision. Ensure that you meet the prospective tenant at least once before taking the decision. Without meeting, you cannot make an informed decision. If you live a significant distance away from the property, make sure a person you trust meets them on your behalf, if you cannot. Having met them once will help you decide if they would be the right tenant for your property or not. By taking a deposit, a landlord can ensure that their property is protected. You can pay for any repairs if it is not kept well by the tenant and le the prospective tenant knows about all your demands and rules if you have any. Only choose them if they agree, and whether possible, put it down in writing to avoid any trouble later. When you start looking for a tenant, you can also consider choosing an agency, which could help you, choose the right tenant and save you the stress and time. Get recommendations from other landlords when you set about this task as other’s insights and opinions could help you better decide and outline points you may have missed. When you choose a tenant, remember to sign a tenancy agreement. This is a very important document which will cover the terms of the tenancy and protect you as a landlord and also your property. Include any clauses, which you want the tenant to agree to. 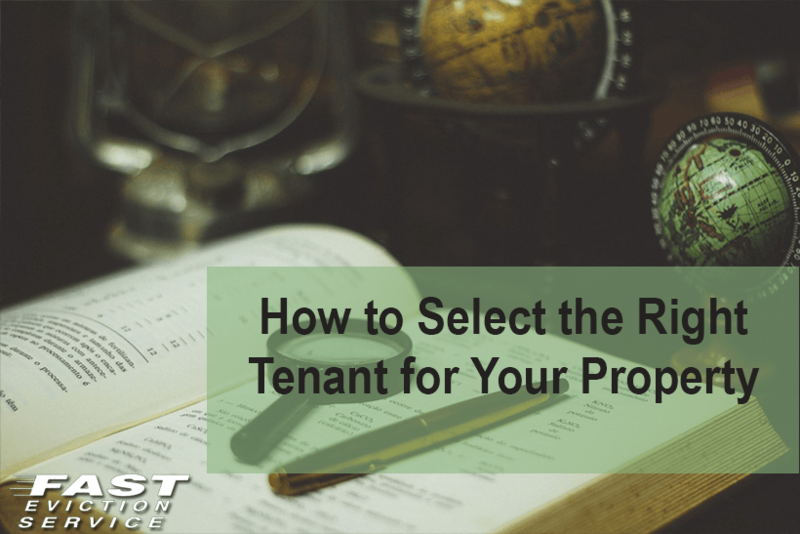 Follow these recommendations and it will do much to help you select the right tenant for you rental property.